While superficially simple, planting vast swathes of land with a single crop introduces a multitude of challenges. Weeds and pests that compete with and can destroy whole plantations spread easily and rapidly, therefore, herbicides and pesticides must be applied to control them. By natural mutation, they develop resistance to these chemicals, necessitating continuous research and development of new compounds that can have unforeseen impacts on environmental and human health. The costs of this unnecessary war are passed on to the farmer and hence the consumer. One technical solution has been the development of Genetically Modified Organisms (GMO) that have built-in herbicides and pesticides and supposedly produce higher yields. In order to maximise profits for their makers, they are designed to be infertile, meaning that farmers are totally dependent on seed suppliers like Monsanto. These multi-national monoliths bribe governments to ensure the adoption of their seeds and take legal action against those that resist. In practice, yields have been lower than the propaganda suggests and despite every effort, man-made genes are infiltrating natural ecosystems. Nobody knows what will be the long term consequences, yet the precautionary principle is sacrificed on the altar of corporate profits. Chemical fertilisers have replaced compost and manure and allowed mono-crops to be replanted year after year on the same land. However, this leads to a loss of trace nutrients necessary for effective immune systems and hence the plants require even more potent herbicides and pesticides. The result is that the nutritional value of the food is low and, as many of the artificial chemicals accumulate in our bodies when we digest them, we are slowly poisoning ourselves and massively increasing the risks of developing cancers and degenerative diseases. In addition, the organic matter in the soil is depleted, along with the macro and micro-organisms that live symbiotically with plants in natural ecosystems like worms which circulate the soil and fungi which take vital nitrogen from the atmosphere and fix it in the soil making it available for plants. 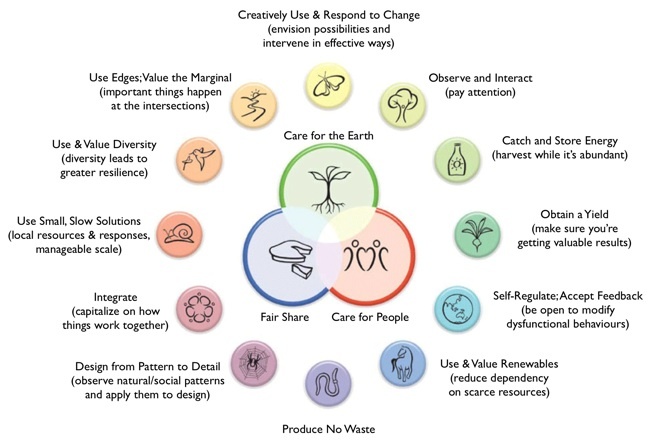 In open farming, permaculture encourages and exploits these symbiotic relationships by creating complex ecosystems of plants and organisms that, while more complicated to implement, are relatively easy to manage once they are established, since they are virtually self-sustaining. The only necessity is to recycle the nutrients from harvested fruits, nuts and vegetables through composting and extracting them from our waste water rather burying them in landfill sites or discharging them into the sea. Biological and technological processes are available to achieve this safely. As the climate changes and countries become increasingly water stressed, it is important to adapt farming practices to new conditions. Nature achieves adaptability via biodiversity, one species that can only just survive under certain conditions might thrive when they change. Rather than burying the planet’s biodiversity in seed vaults, it makes more sense to plant it and work with natural processes rather than against them. This should be taken further than simply maintaining botanical gardens. Re-wilding means restoring areas of land and sea to their original states as habitats for plants and animals and setting them aside, free from human interference, to flourish and evolve, if not for their intrinsic value, then for the potential benefit of future generations. Permaculture also embraces closed farming approaches, such as planting in containers and using soil-less techniques (hydro and aeroponics). This enables food to be grown, quite literally on our doorsteps, balconies, roofs and even indoors, if there is sufficient lighting or despite a lack if it in the case of mushrooms. Outside our buildings, kitchen gardens, community gardens and edible landscaping still place food production within walking distance, potentially eliminating the need for dedicated agricultural land and the associated transport costs and environmental impacts. While gardens and gardening both have proven therapeutic benefits, not everyone is green-fingered or has the time to devote to tending plants. Cooperative approaches to food production both create jobs and build communities by uniting those with time with those who have the space for cultivation. Teaching all children to grow food on school premises and to prepare it for meals is the ideal way to engage them with the natural processes that sustain us, while inculcating a culture of self-reliance and removing false gender distinctions. This is also the best way to change the nation’s unhealthy and unsustainable diets so that we become a people who eat what we grow and grow what is healthy.